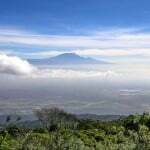 When Kilimanjaro alone is not enough...discover enchanting Meru, too. 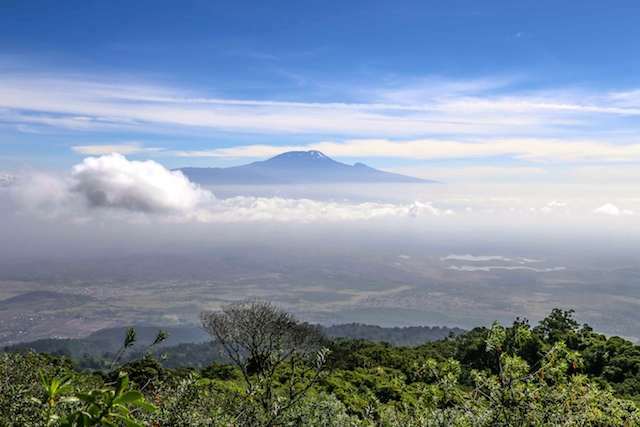 For the explorer who wants something more challenging, we are excited about our 12 day tour that takes in not just the grandeur and majesty of Kilimanjaro, but also Kilimanjaro’s little brother and nearest neighbour, Mount Meru. Meru is a tough gem with a violent volcanic history that has carved it into its unique shape – but don’t worry, the last eruption was more than a hundred years ago! Set amidst the glory of the Arusha National Park, it dominates the park’s horizon. The fertile plains and lakes of the park are teeming with wildlife – monkeys, giraffe, zebra, shy dik-diks as well as leopard and spotted hyena - on which you’ll be able to gaze as you journey to Meru’s slopes. 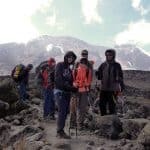 And it’s not an easy climb – Africa’s 5th highest mountain is a challenging trek in its own right but perfect for a three-day acclimatization for your next challenge – Kilimanjaro. Words can’t do justice to Kilimanjaro. You have to see for yourself. And it’s not just about the glowing skies, the lush foothills, the desolation of the upper reaches or the glorious views. It’s about your own resilience, your own endurance and toughness in the face of a serious but beautiful challenge. You’ll experience not just the external wonders of the climb but you’ll find by the end of your adventure you’ll have found out more about yourself. Knowledge is a beautiful thing. We’ll transport you from Kilimanjaro Airport to a comfortable B & B at Moshi, the base town for most Kilimanjaro adventures. You’ll meet up with your fellow travellers and your tour team, and we’ll take you through a detailed itinerary as well as all safety aspects and a kit check to make sure you have everything you need and that it is up to standard: safety isn’t an option on our adventures! If you have a little spare time, Moshi’s relaxing coffee shops and bustling market with its blend of African and Asiatic influences will keep you busy. Overnight at Moshi. An early start to take advantage of the cool, clear morning as we drive to Arusha National Park for our Meru adventure. Arusha National Park is a naturalist’s and botanist’s dream; the spectacular cliff-edged Ngurdoto Crater set in lush forests of Spanish moss ; the azure and teal Momela lakes, verdant grassland and savannah – the breathtaking array of landscapes support a plethora of animals such as waterbucks, dainty klipspringers and colobus monkeys as well as nearly 400 species of birds. The park was also the exotic backdrop to Howard Hawk’s 1962 epic “Hartari”, starring Hollywood legend John Wayne. 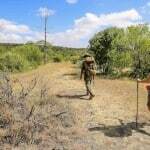 The trek begins near the Ngarenanyuki River. 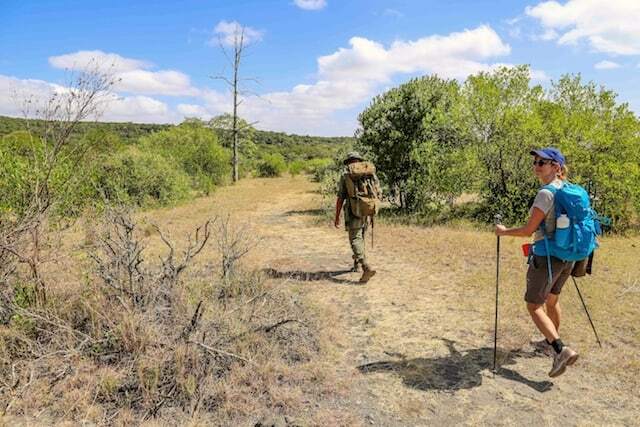 As you trek you can expect to admire buffaloes, waterbucks, giraffes, warthogs, zebras and gazelles and if you are lucky, spot a far-off elephant or leopard in the shimmering distance. We’ll round off the day of excitement at the Miriakamba Hut, where we will enjoy a tasty dinner and an early night ready for our day of activity tomorrow. You’ll need a good, energy-dense breakfast for the steep hike up the path from Miriakamba to Saddle Hut. The wooden steps at the start of your journey make way for a wild path jostled on all sides by lush forest woodland and, as it thins out, as you trek ever higher, you’ll catch glimpses into Meru’s crater. 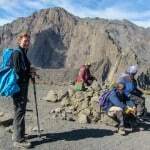 If you are feeling energetic, you have the choice of ascending to Little Meru (3820m) and back in time for a well-earned dinner at Saddle Hut and early night, ready for your journey to the summit of Meru, which starts at midnight. This is the trickiest part of your Meru adventure: a seemingly-innocent flat path followed by some nippy switchbacks, by the light of your headlamp alone. A brief downhill stretch after Rhino Point will bring you to a slow and steady climb and you’ll need all your strength to scramble along the path, which is a challenging choice of volcanic rock or loose gravel. But, at the summit, the incredible views of patchwork landscapes that the sunrise paints with pink and apricot will make the effort worthwhile. You’ve time to take photographs and bask in the delight of your achievement before we retrace our steps back down to Saddle Hut, but this time you’ll see what you missed on the ascent- the morning skies turning from gold to the brightest blue, cotton-wool clouds below you, mountains in the distance and the crater-edge trail before you. 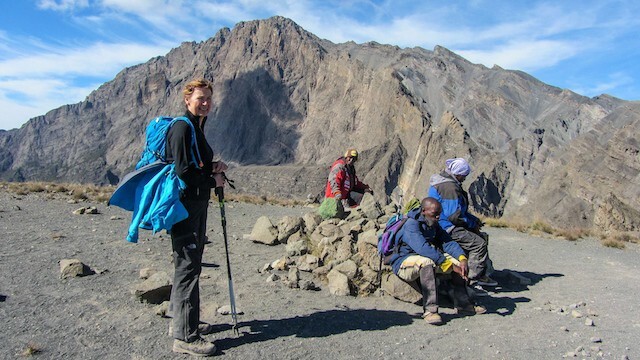 A tasty lunch at Saddle Hut will re-energise you for the trek back to the Miriakamba Hut and final stages of your Meru adventure, before your Kilimanjaro adventure begins. After a well-deserved and filling breakfast at Miriakamba Hut we’ll set off through cloud forest towards Momela Gate. Cloud forest is a landscape to be experienced rather than described. Imagine yourself in an enchanted lichen-festooned forest, sometimes eerily silent but more often alive with the calls of the Black-capped Mountain Greenbul, African Crowned Eagle or one of the many species of native or emigrant bird who thrive there. At Momela Gate our transport will be waiting for you and after you’ve had the chance to buy a soda and a celebratory t-shirt, we’ll whisk you back to Moshi where you can relax in the afternoon while you take in your Kilimanjaro orientation. This is the big one! But the confidence you’ve gained in your triumph over Meru should give you wings for Kilimanjaro. After a good night’s sleep and a sumptuous breakfast, you’ll depart Moshi for the Machame Gate, nestling in lush rainforest at the southern foothills of Kilimanjaro. The 45 minute drive will pass through the real Tanzania – off the beaten track coffee plantations and sleepy villages. At the Machame Gate, we’ll get the kit ready while you register with the national park authorities – safety is taken very seriously at the park. 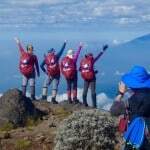 Your journey to Machame Camp starts through rainforest ablaze with the colour and sound of vivid plant and animal life but as you ascend you’ll join airy, breeze-caressed grasslands and wildflower meadows abuzz with insects. 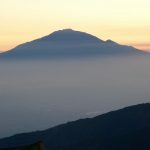 As you reach Machame Camp you’ll be rewarded with a spectacular view of your goal – Kibu Summit: so near and yet so far! Relax after a hard day’s trek as your chefs prepare a tasty dinner for you al fresco, where you can indulge in some good food and good conversation under the sky ablaze with stars. The most spectacular day is ahead of you. After a hearty breakfast you’ll gather your gear and set off on an open, sunny trail with vast blue skies above you and sunshine chasing off any lingering dawn mists. As you ascend, nature will treat you to an array of breathtaking sites: forest canopies towering above you and golden savannah stretching for miles below and, in the distance, the ominous volcanic peaks of Mawenzi and Kibo. Today’s journey will help you acclimatize to higher altitudes and as you climb to high moorlands, the wildflowers and grasses thin out but you’ll have the company of groundsels, heather and the impressive Lobelia Deckenii. Rest overnight at Shira Camp. You’ve made it over half-way on this challenging route, but the best is yet to come. 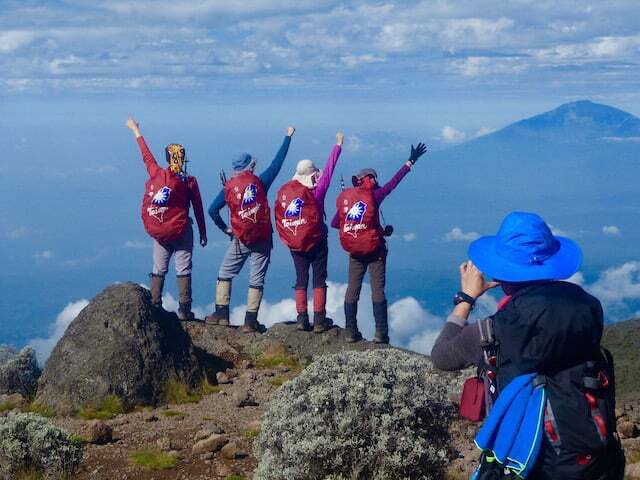 Today you’re aiming eastwards towards the gorgeous Shira Plateau on ever-steeper terrain as you climb you’ll witness one of the famous sites of Kilimanjaro – you’ll approach the Lava Tower, a 300-foot high plug of volcanic rock that transforms from a glorious landmark into an ominous, looming passageway as you pass by. 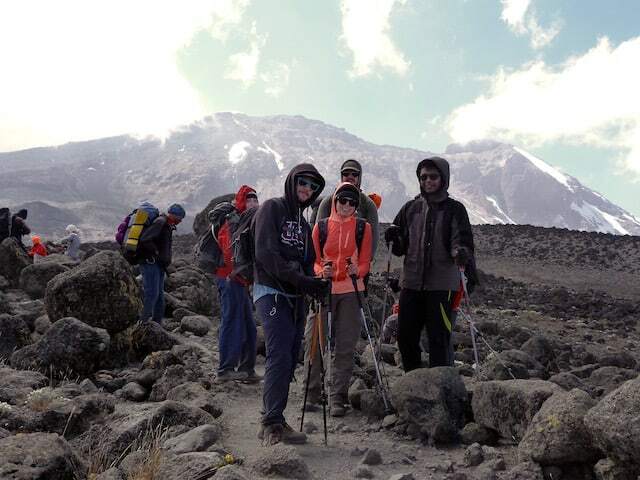 Your hard work will be rewarded with a quick descent towards Barranco Campsite, and on this slightly easier section you’ll have the energy to enjoy the views before you arrive at the Camp, which is the most scenic of all the camps on Kilimanjaro. You’ll sleep hemmed in on one side by volcanic cliffs and glaciers glinting in the sunshine, with the stunning Kibo peak directly in your eyeline across wide, empty skies. Enjoy a hot meal before a well-earned rest. You’d better get a good breakfast down you because the first thing you’ll need to do this morning is scale the 300 metre high Barranco Wall – known, we wonder why? - as the Breakfast Wall! This 90-minute scramble up volcanic cliffs tops out with the majestic Helm glacier towering above you, and it’s is a great way to tire out those calf muscles before heading off towards the Karanga Valley, where you’ll be scrambling over bleached scree on an up-and –down route with stunning views to your right all along the trail and the glimmering Heim, Kersten and Decken glaciers keeping you company. As Kibo towers magnificently over you on your left you’ll stop at Barafu camp for an energy-dense dinner and an early night, ready for your push for the summit. You’ll rise at midnight for the final push to Uhuru Peak, along a trail path lit only by your head torches. You’ll need your wits about you as this is the steepest and most challenging part of your adventure. The quiet darkness, the frosty night air, blackness on either side and the only sign of company the bobbing firefly lights of your companions’ head torches will give you a unique sense of peace and stillness on your ascent. 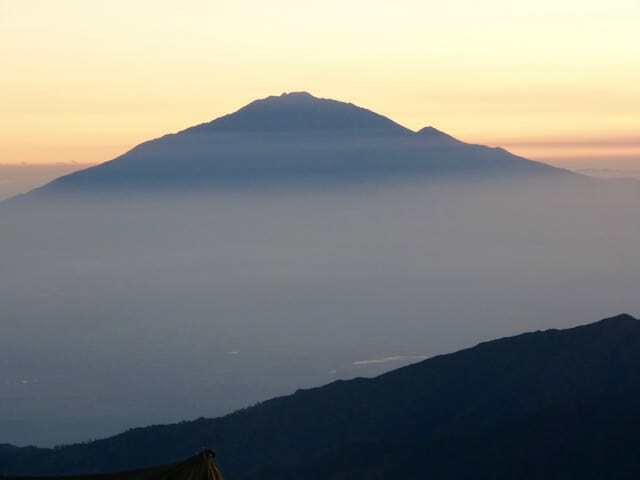 As the sky imperceptibly lightens with the coming dawn, Uhuru Peak awaits you and you’ll reach it just as the sun starts to glimmer on the horizon. You’re standing on the rooftop of all Africa, and gazing down at the swirling cloudscape and glinting ice fields, you’ll understand just how far you’ve come. Celebrate with your team and soak in the atmosphere before returning to Barafu Camp for a hot, filling breakfast and shared stories of effort and wonder. The day ends with your arrival at Mweka Camp, where you’ll spend the night after a hearty dinner lying beneath the stars, resting your tired but happy body. Wake up on your last day on the mountain rested and triumphant—you’ve just conquered Mount Kilimanjaro! After a leisurely breakfast, you’ll stroll towards Mweka Gate through gorgeous forest scenery draped in cloud and mist. A Viva Africa Tours vehicle will be there to transport you back to Moshi where a hot shower, soft mattress and fresh set of clothes await. Today we will drive you to the airport from where you will connect your flight back home. If you’ve decided for a safari – well, that’s a new adventure and we’ll take care of that too!